CV joint repair cost varies from vehicle to vehicle. Constant Velocity, or CV joints, as they are commonly known, are one of the little mechanical and engineering marvels we tend to take for granted but which make our lives easier. Or at least they will help our vehicles operate more smoothly. A CV joint is designed to allow the power from a vehicle's engine be transferred, via it's axle(s) to the wheels and thereby propel the vehicle along to it's intended destination. A CV joint allows the wheel and the axle to always move at the same speed. This prevents complications when cornering, hitting a bump or having to maneuver out of the way of something. CV joints were developed for front wheel drive vehicles but are also becoming commonplace for modern wheel rear drive and all wheel drive vehicles. Because of the important role they play in keeping your vehicle running smoothly, it's important to have CV joints inspected on a regular basis. A CV joint repair estimate will depend on the age and type of vehicle you drive. If you have some mechanical skills yourself, and are so inclined, you can do the job yourself with a CV repair kit. Your CV joints need reliable foot wear. No, of course your CV joints don't really have feet. They do, however, wear boots. Boots is the descriptive term used to designate the protective covering that encompasses your CV joints. Although the boots are designed to last regular inspections are still warranted. You should ask your mechanic to check and see if you need CV joint boot repair at least as often as you have your oil changed. This is because the boots can become damaged by bumps, potholes, rocks or other debris over which your car has passed. It's important to do frequent checks primarily because, if caught early enough, your mechanic may be able to take care of the boot before the cv joint itself goes bad. The money you could save should be sufficient motivation to make sure the CV joint boots are checked on a regular basis. Boot inspections are relatively simple and can be done by practically anyone who is inclined to do so. Use a good flashlight to visibly inspect the boot for cuts and gouges. You must also run your fingers over the boot. When you do this you're checking for the presence of grease. Finding grease means the boot has been damaged and the grease used to lubricate the CV joint is being expelled. This is a serious enough condition, but, what makes it worse is the fact that now dirt and other debris can get in and damage the CV joint. 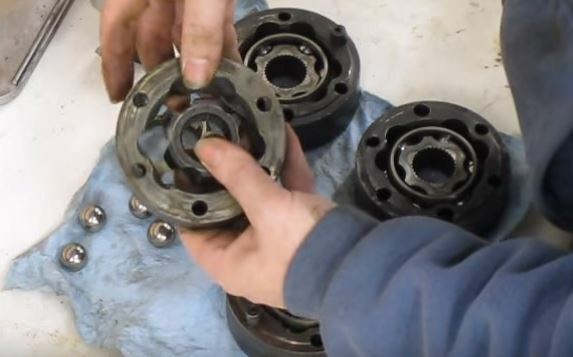 Elkhart mechanics can also handle your ATV CV joint repair. We also do ball joint repair.